This Buddhist retreat by Walters & Cohen Architects features a cluster of pitched-roof structures arranged around tranquil courtyards in the English countryside. 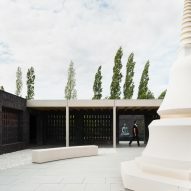 The Vajrasana Buddhist Retreat Centre is located on the site of a former farm in Suffolk and is operated by the London Buddhist Centre (LBC), which awarded the project to Walters & Cohen Architects following a competition in 2013. The London-based studio was tasked with refurbishing an existing 1900s farmhouse, in addition to increasing the retreat's capacity from 34 to 60, improving accessibility and introducing new facilities including a shrine room. The firm developed its proposal based on the tenets of Buddhism. In particular, the design was informed by the principle of "doing the least harm", and therefore seeks to minimise its impact on its surroundings, while creating an appropriately restrained and sensitive environment. Occupying the footprint of demolished outbuildings, the new centre applies simple materials and forms to generate a pared-back aesthetic that supports the spiritual activities taking place on the site. "We had to work hard to find the right architectural language; spiritual, essential, stripped of anything unnecessary and deeply rooted in its place," said studio co-founder Cindy Walters. The project involved renovating the farmhouse building to make it suitable for use as the main staff headquarters, and replacing the old barns and sheds with accommodation and spaces for meditation. The buildings are placed around a series of courtyards connected by landscaped gardens and pathways. The largest of these is flanked by structures containing the guest rooms, living and dining spaces. 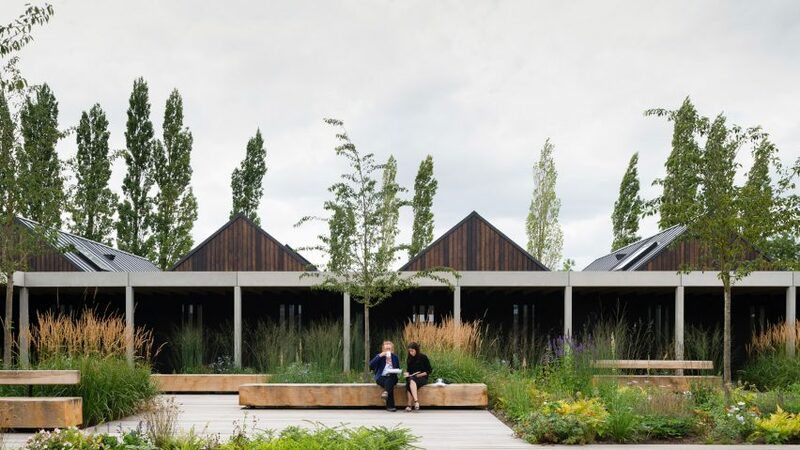 The communal facilities are accommodated in a long gabled block extending the length of the courtyard on one side, while the bedrooms are positioned on two other sides of the square in pods that have individual pitched roofs. 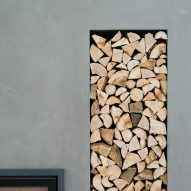 Plywood and painted blockwork form the basis of the raw and minimal material palette used throughout the accommodation areas. Pitched ceilings enhance the spacious feel of these sparsely furnished spaces. Colonnaded walkways connecting the various structures and courtyards frame views of the surrounding countryside and the internal gardens, developed in collaboration with landscape architects BHSLA. 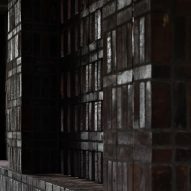 From the communal Sangha courtyard, the more tranquil and contemplative spaces of the Stupa and Akshobhya courtyards can be glimpsed through large openings and perforations in the dark brick walls. The Stupa was designed by members of the LBC and is made from Portuguese limestone. The symbolic structure has smooth, sculptural surfaces designed to change in appearance as the light alters throughout the day. A two-storey block contains the shrine room, in which the brick used externally also forms internal walls. This creates an environment with nothing to distract from the large Buddha statue. High-level perforations allow shafts of sunlight to filter into the room, casting patterns of light and shadow on the floor.